Ohhh this is our last week of spring preschool storytimes! And actually it's our last week of most programs. Since we'll be visiting all the schools (13 visits in all for our department, plus I will probably go visit the middle and high schools with our teen librarian), we offer almost no programming in May. We'll start back up with drop-in family storytimes in June (and also eleventy billion other programs...). Opening Song: "Shake Your Sillies Out" by Raffi. I have enjoyed using this song, but Raffi's version is in a terrible range for me. It's too low, but if I take it up an octave, it's pretty darn high. I play the CD (and I need something on CD since not all of my staff are comfortable with singing alone), but the kids really respond better to my singing. I will look for another opening song for our fall session (any suggestions?). Memory Box Item: This week's Memory Box item was a crab from the book Bear in the Air. In retrospect, it was not the best memory box item because there are crabs on LOTS of pages and the kids kept yelling out "There's a crab! There's a crab!" instead of listening to the story. Have I mentioned that my group is kind of rowdy? 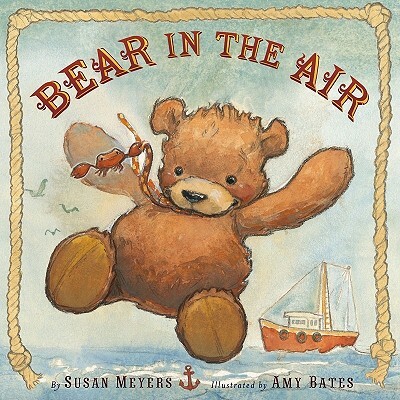 Book: Bear in the Air by Susan Meyers. I shortened it a bit because it was too long for my rowdy crowd (I clipped several pages together in the middle), but this one still didn't hold their attention. It could have been because I had a guest from Toddler Time who was not quite ready to sit and listen to stories and she was distracting the other kids. Oh, well. Sometimes a story doesn't quite work. Sometimes it will work for one group and not another group. You live, you learn, and you move on to something else! Rhyme: Teddy Bear, Teddy Bear. Anything that gets this group up and moving is a good thing. I probably could have done this five times. They loved it. Book: Knuffle Bunny by Mo Willems. This one was a hit. Put copies of the sequels on display for kids to check out and take home with them! Felt Activity: Toys in the Toy Box. I passed out felt pieces to everyone and when I called their toy, I invited them to come to the front and put it "in the toy box" (i.e. on the felt board). When we do our registered storytime sessions again in the fall, I think I will try to come up with rhymes or songs to go along with these activities every week. I probably can do it, but usually I don't think about it in time, so I end up just saying "If you have an elephant, bring it up and put it in the toy box!" Book: Where's My Teddy? by Jez Alborough. Love this book! Love it, love it, love it! It combines a simple rhyming text with big, bright illustrations to tell a funny story. Love this book. The kids loved it, too. There were ten in the bed and the little one said, "Roll over! Roll over!" So they all rolled over and a red one fell out! And so on. If you have the right crowd, you could invite kids to come up to the board and take off the appropriate color. And repeat as necessary! Take-Home Craft: Teddy Bears. We cut out teddy bear shapes (using a die-cut would be a lot faster, but our teddy bear shape wasn't quite big enough for what we had in mind...) and provided scraps of cloth and buttons for kids to glue on to decorate their bears. The cloth came from old shirts from Goodwill that we had leftover from previous events. And that was IT for our spring storytime series! Stay tuned - next week I'll be posting a reflection of the series overall and what we want to keep and what we might like to change.